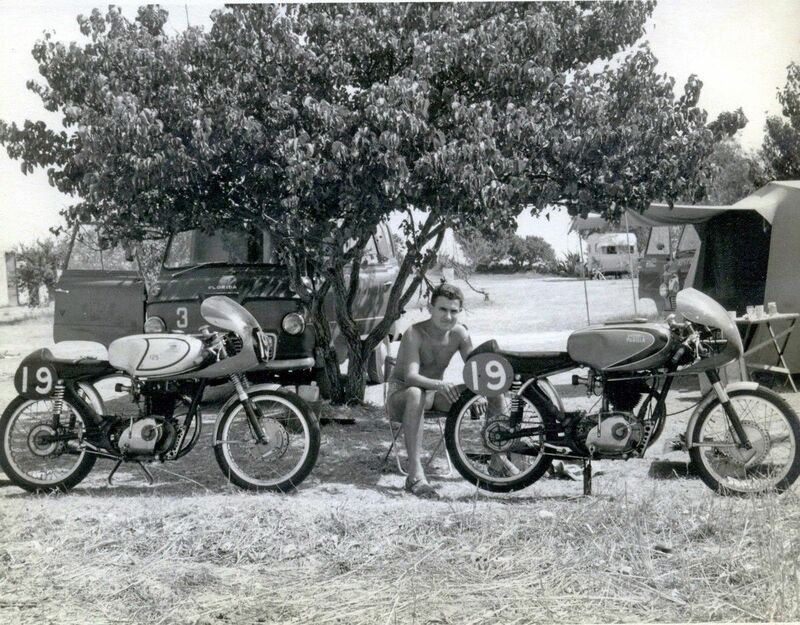 Before elaborating on specific events during and between races, it might be useful to describe the life of Mr Average “Continental Circus” rider and some of the conditions under which he was working and living in the 60’s. Numbering between 30 to 40 regular ‘privateers’, who were the very heart of the ‘Circus’, they came into racing from many diverse walks of life and from various countries. Australia, New Zealand, South Africa and Rhodesia regularly supplied a new crop of young (or not so young!) talented riders each year. In my own case, born in London, I was first and foremost a tool maker before being labelled an automotive engineer. Paddock life in ’64, Albi,France. Vernon Cottle & his wife preparing tea, Peter Gibson waves whilst polishing his Ducati. Ginger Molloy’s van behind him & RMs in the far distance. With start money at around £50 for the lightweights, rising to £70 or £100 per start for the 350 and 500cc classes, the name of the game for the ‘privateers’ was to get as many starts as possible, within the constraints of the number of miles they had to travel between races, at times travelling over 1000 miles between meetings and crossing many country borders. This was not always easy in the 60s. Manx Nortons, 7R AJS and G50 Matchless were the first choice of the ‘privateers’ in the 350 and 500cc classes. There were more makes to choose from in the lightweight classes including Moto Guzzi, Morini, Mondial, Ducati, MV, Aermacchi, Benelli, N.S.U and Bultaco and even MZ, Jawa and CZ but these were difficult for ‘privateers’ to get their hands on being from behind the Iron Curtain. Many of these bikes were ex-works machines and some quite long in the tooth. Most of the established Works Riders were joining the Japanese Honda, Yamaha and Suzuki teams and, not surprisingly, beginning to take all the top prizes and World Championship points in the lightweight classes. Most ‘privateers’ travelled with wives, girlfriends, mechanics, and without doubt, the most used transporter was the very reliable Ford Thames van. Some were modified to take Ford Zephyr 6 engines, these raised a few eyebrows as they motored across the autobahns of Europe at over 80 MPH, this was a high speed for any van in the 60s! The vans were not only the ‘privateers’ means of transport but were their homes for much of the time when the riders were on the road — no luxurious motor homes in these times! — not even for the Works Riders who were referred to as ‘ Raiders’ by the “privateers”. They gained this title as a result of their habit of only entering the World Championships & selected other International meetings where high prize money could be gained. They would then shuttle back to their own countries to race in their National Championships leaving the “Circus privateers” to support the not so well paid remaining European meetings! One of the biggest problems for the “privateers” was getting entries, and when they did, getting confirmations back (no internet then). This was particularly difficult for riders trying to race in East Germany, Hungary, Czechoslovakia or Yugoslavia as visas were required to enter these countries and could not be obtained until a rider was in possession of a written invitation from the race organiser. Even after getting the requisite invitation the lucky, or not so lucky, riders had to camp out,sometimes for days, at the Austrian International camp site in Vienna, waiting for the respective countries Embassy to issue visas. Somehow, in the end, they all seemed to manage in one way or another! So, onto a bit more about me and the Parilla factory….